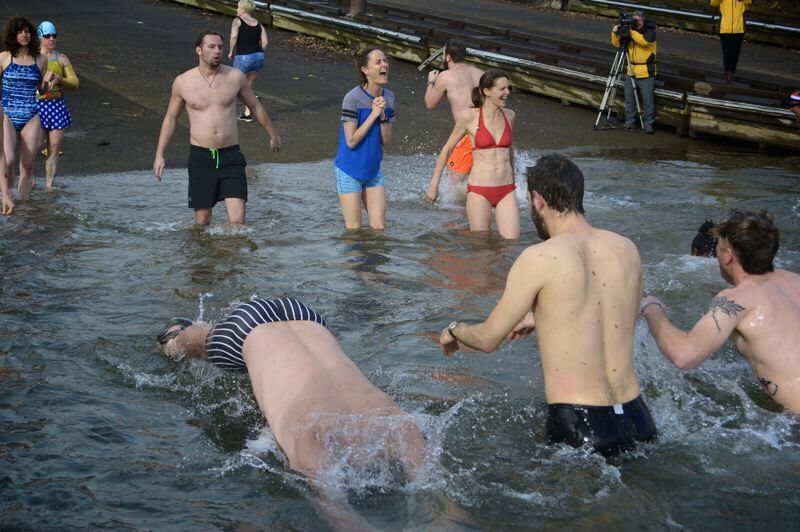 Join several dozen people for an early-morning dip in the Willamette River, in the second-annual swim sponsored by the Human Access Project. Looking for a new way to celebrate Valentine's Day? How about taking a dip in the Willamette River? For the second straight year, the Human Access Project invites folks to jump into the river on Thursday, Feb. 14. It's a festive way to call attention to the river's swimmability in light of the city effort to restrict combined sewage overflows. Swimmers hope to celebrate 108 days in a row without a sewage discharge, which was a common occurrence before the $1.4 billion Big Pipe project was completed in 2011. Subsequent water quality testing by the Bureau of Environmental Services, which managed that massive project, shows the river is usually safe enough for swimming. Participants will gather at 7 a.m. at the Willamette Park boat ramp in Southwest Portland. The Human Access Project has arranged for Sauna Velo, a mobile bike-towed sauna, to offer its services so folks can warm up before jumping into the 44-degree river. All participants will receive free coffee and treats, plus two free admissions to the 9th-annual Big Float on the Willamette, scheduled Saturday July 13. Find out more at humanaccessproject.com.